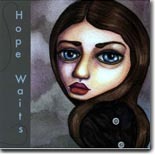 A new artist on the scene, Hope Waits, has a stunning new CD that's worth seeking. It's this month's Pick Hit. Veteran blues guitarist Eugene Hideaway Bridges has released his fourth album, and it's a good one. He chose this disc to be his self-titled release, and we liked it so much that it's our Surprise CD of the month. Chicago crooner Jesse Fortune only released one album in his career, but it turned out to be one of the best of the '90s. A look back at the disc, Fortune Tellin' Man, is this month's Flashback feature. Our What's New section features new releases from Big George Brock, Dicky Williams, Charles Wilson, ZZ Hill Jr., David Brinston, Toni Price, Jook Bourke, Downchild, Andy Martin, The Detonators, Elvin Bishop, Stacy Mitchhart, and more, and a look at a DVD from the late, great Son Seals.